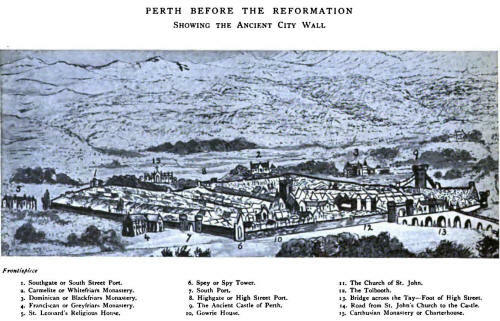 Foundation and Early History of Perth, the Ancient Capital— Roman Occupation—Victoria—Site of Agricola's Camp- Site of Ancient and Modern Perth—Bertha, St. Johnstoun, Perth—Walls, Gateways, and Fortifications—Some of the Ancient Monuments—Battle of Mona Grampius and supposed Site—Roman Camps at Battledykes, Haerfaulds, and Kempstonehill—The Druids and their Customs—The Druid Encampment at Perth (Kilspindie)—The Picts, who were they?—The Dawn of Christianity—St. Columba at Inverness and Perth—Conversion of the Picts to Christianity by Columba—The Columban Church and its form of Government—Burning of Ions in 813 by the Danes—Dr. Anderson on the Geology of Perth. The Ancient Church of St. John—Foundation and Early History—The Cutty Stool, Knox's Pulpit, and the Royal Pew—Edward I. celebrates there the Feast of the Nativity of St. John—Edward III. assassinates his brother before the Altar—Tombs of James I. and the Gowries—Charter from the Monastery of Dunferrnline granting the Town permission for interments—Confirmation of this Charter by the Prior and Bishop of St. Andrews—The Town in 1475 in trouble respecting a Chaplain for the Altar of the Virgin Mary—Ordinance issued to the Provost and Magistrates by the Cathedral Church of St. Andrews—The Incorporated Trades seat the Church—Strange Marriage Customs adopted—The ancient Bells of St. John's, and their remarkable Inscriptions—History of the Communion Cups—The forty Catholic Altars which adorned the interior, with names of Founders. The Ancient Monuments of Perth—The House of the Green —Lowawark and Boot of Balhousie—The Ancient Castle of Perth—The Gilten Herbar or Gilten Arbor—The Ancient Castle of Kinnoull—The old Mercat Cross of the Burgh—The old Parliament House—Halkerston Tower— The Dragon's Hole—The Inches—Perth Grammar School and Sang School—The Fair Maid's House—Gowrie House—The Monkstower—The Spy Tower. The Four Monasteries and the Ten Religious Houses—The curious Lease of the Blackfriais Croft between the Prior and John Malcolm—The general appearance of the Monasteries as they were, by an Eye-Witness—The legend of St. William of Perth—The two Hospitals of King James VI.—The Meikle and Little College Yards— Perth Harbour—The Great Floods in the River from the earliest times up to 1814—The Ancient Bridges washed away and reconstructed—Curious inscription on General Wade's Bridge—The Bridge that took eighteen years to build and was carded away—The action of the Lords of the Privy Council—John Murray of Tibbermore and the Magistrates quarrel over Pitheavlis Quarry—The Lords of Session settle the quarrel on appeal. The Ancient Kingdom of Scone—Its Early History—Forteviot Palace—The Ancient Abbey and Monastery—Foundation Charter of Alexander I., in 1115—The Moothill of Scone —Site of the Ancient Abbey—Royal City—Friars Den and Gateway—Scone a Shipping Port in the twelfth century —Establishment of Canons Regular at Scone—Charter of Malcolm IV. in 1164—Coronation of Alexander III. at Scone—Coronation of Robert II—Meetings of the Scottish Parliament at Scone, 1284, 1286, 1294, 1366—Charter by the Commendator of Scone creating Lord Ruthven Sheriff of Perth—Charter creating Lord Rutbven Perpetual Cornmendator of the Abbey and Monastery of Scone—Charter granting the Lands of the Abbey of Scone to Lord Ruthven, 1581—The Ancient Earldom of Gowrie, held by Donald Bane, afterwards King of Scotland—Act of Parliament dissolving the Abbey of Scone in favour of David Murray, Lord Scone, and conveying to him the lands of Scone, forfeited on Gowrie'a Attainder. BARONY OF GOWRIE: Family of Ruthven—BARONY OF SCONE: Family of Murray, Viscounts Stormont, and Earls of Mansfield—BARONY OF KINNOULL: Families of Erskine, Crichton, Oliphant, Hay—BARONY OF GRAY AND KINFAUNS: Family of Gray, Family of Charteris of Kinfauns —BARONY OF BALHOUSIE: Family of Eviot. The Scottish Parliament: Scottish National MSS.—Battle of Luncarty—The Dual Tragedy, Duncan and Macbeth—Malcolm Canmore, Queen Margaret and Dunfermline Abbey—Interview between William the Conqueror and Malcolm Canmore—Witch Pool at Woody Island—Perth merchant ships in 1128—First Convention of Estates at Perth: First Ecclesiastical Council—Reign of William the Lion, who resided at Perth—His remarkable Bye-laws—Translation of his famous Charter of 1210—His Funeral Cortege at Perth Bridge—Curious interview of Alexander II. and Henry III. at York — Romantic marriage of Robert Brace's Parents—Alexander III. and the King of Norway—Sir William Wallace and his heroic Career—Battle of Elcho Park—Fawdon's Ghost meets Wallace at Gask House—First Siege of Perth. Battle of the Clans on the North Inch—Dundee and Perth vessels captured coming from Flanders—Capture and Ransom of James I., and his Personal Obligation to pay— Coronation of James I. at Scone—His Assassination in Blackfriars Monastery—Assassination of Douglas by James II.—Perth Magistrates burn Noblemen's houses: extraordinary conduct—Presentation at Perth of a Horse to James III. on the occasion of his visit—Visit of James IV. to Perth—Stobhall and the Drummond Family—The Ferry Boats at the North Inch: Kincarrathie Boat— Lease to Lord Stormont in 1536—Magistrates sink the Boat—Battle for the Provostship in 1544, and sixty persons killed—Martyrdom of Six Citizens—Methven Castle and its place in history—Methven Castle as a Royal Residence— The Laird of Methven marries Queen Margaret—The Famous Riot at Methven Castle in 1594—The Laird's wife presents a loaded pistol at the Covenanters in Methven Wood—Her letters to her husband regarding this incident. 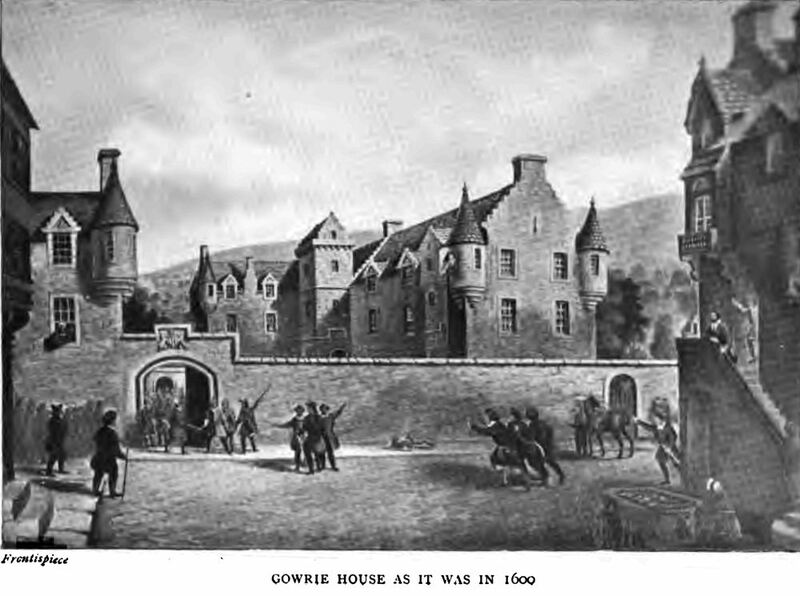 The Sheriff of Perth orders certain persons to be executed— The Provost ordains thieves to be hanged—Two Provosts elected for the Burgh—The twelve Burgesses who sat in the Tolbooth with the Provost and Magistrates—The Magistrates appear before the Lords of Session to explain their book-keeping—The Regent appoints Ruthven to be Provost—Abolition of Craftsmen as Councillors—Seizure of the Blackfriars property by the Town Council—Election of Magistrates by the Queen—The King in 1572 elects the Council—Grey friars authorised as a Burying-ground— Expulsion of the Town Clerk by physical force—Council refuse to recognise the King's nomination of Councillors—The Dean of Guild assassinated in the streets of Perth by a Burgess, and the Burgess hanged—The King's characteristic visit to Perth after he assumed the English Crown —The Town Council call a Minister—The Town Council reformed and reconstituted by the Convention of Burghs. Register of the Provosts, 1666 to 1800—How the Town's accounts were audited in 1577, and the Treasurer clapped in the Tolbooth—The Incorporated Trades ; their origin and administration—The Ancient Craftsmen and Merchants Guild ; their exclusive rights and privileges ; their Festivals Corpus Christi and St. Obert's Eve—The Vatican Archives. The Raid of Ruthven, 1582—Capture and Execution of William, first Earl of Gowrie—list of the Ruthven Raiders—Kid-napping of John Anderson in Blackfriars Burying-Ground —Ruthven captures him, and loses him—The Bloody Roll of the Burgh, 1556-1580 —'The Cautioners' Roll; the Horners' Roll; the Justice Roll—Roll of Transgressors for 1630, cited for dishonest trading—Coronership of the Sheriffdom of Perth—Remarkable quarrel of 1580, Perth and Dundee—Magistrates of both summoned before the King—Dundee Magistrates personally deforce the Perth Sheriff-Officer—Masters of the Hospital summoned before Privy Council — Magistrates burn Gasconhall House at night, and carry off the landlord in his shirt—Six of the Council imprisoned in Blackness Castle — Lindsay of Kinfauns seizes Pitfour Castle, expels the Family, and takes possession—Robert Martin kidnapped by the Magistrates— Thirty-four men at night eject an Abercairny tenant, and take possession of everything — Bruce of Gasconhall kidnaps two Councillors, and has them stripped and whipped—John Welsh, the King, and the Devil-Courts of justice to be removed to Perth. The Earl of Errol put in the Tolbooth—Laurence, Lord Oliphant, puts two farmers in the Thieves' Hole, Dupplin —The Blaster of the Tolbooth writes his own agreement— Provost and Magistrates ordained to provide Scarlet Robes —Mistaken identity case: Magistrates imprison the wrong man—Justices of Peace fix scale of labour rates—Patrick Blair of Ardblair defies the Justices—Imprisonment of the Weaver Incorporation for not paying their taxes—Dean of Guild attacked at his house with swords and dirks—Curious Proclamation: export of eggs stopped — Characteristic petition to repair Tolbooth — King fixes four standard holidays—Comic Incident on the High Street: Magistrate stripped and whipped by twelve youths—The General Assembly and the Five Articles of Perth—Tobacco selling in Perth at sixteen shillings per ounce—Dunkeld refuses to recognise Perth Dean of Guild Court—Dundee requires a hangman and gets one—Privy Council ordain all future Provosts to be burgesses — Remarkable abduction of Elisabeth Henderson—Smuggling. 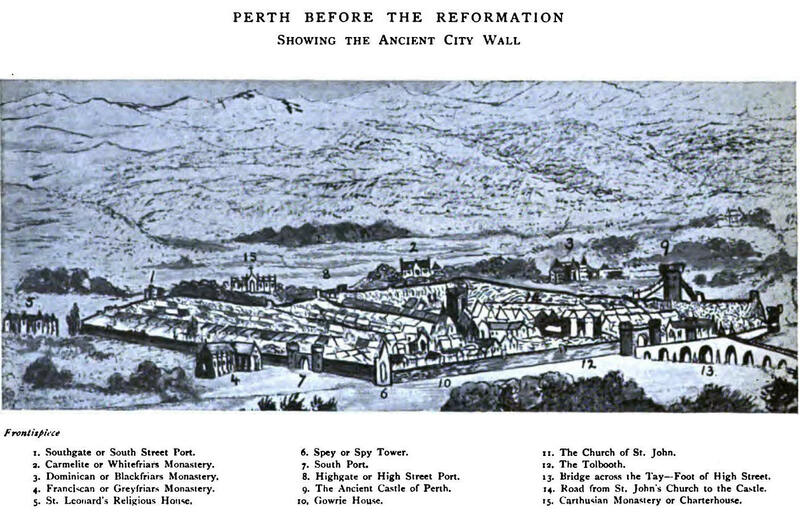 Trials at Perth for Witchcraft, 1623—Three Witches burned on the South Inch, 1598—Visit of Charles I., and Entertainment on the River—The Morrice Dance—The famous General Assembly at Glasgow of 1638—The Five Articles of Perth abolished — National League and Covenant approved, and Episcopacy condemned—Perth Town Council, the Conscription, and the Covenanters— Dialogue in the Perth Tavern, Montrose and Murray of Methven—Battle of Tibbermore; surrender of Perth, and flight of the Inhabitants—Defence of the inhabitants by the two local clergy—Execution of Charles L, and Proclamation of Charles II.—Entertainment of Charles II. on the River; Perth compelled to support the King's Life Guard —Coronation of Charles II. at Scone—Horning of unlicensed Craftsmen and illegal traders—Synod of Perth chased by sixty women; extraordinary proceedings—Bailie Deas requires the Town Council to be purged or Popery-Battle of Killiecrankie—The Guildry Incorporation of Perth. Perth and the Reformation of 1559—The fight for the Sheriff Clerkship—The famous Pacification of Perth subscribed by the Lords of the Privy Council—Commendator of Aber-brothick becomes pirate and seizes boats on the Tay— Perth and its commercial activity in the middle ages-Detailed Report and condition of the Common Good— Town Council petition Parliament to introduce Protection —Donald M'Donald gifted for life to the Earl of Tullibardine—Two petitions to Parliament by the Council against the Union—Duke of Atholl borrows the town's hangman—Town Council present an Address to King George—Public Library and Rules proposed in 1723— The Town and the Monastery litigation case. The Rebellion of 1715 as affecting Perth—Seizure of Perth by the Jacobites—Provost Austen and the Magistrates run away—Appointment of Jacobite Magistrates—Ten Citizens put in the Tolbooth and bailed out by Provost Austen— The Battle of Sheriffmuir—The Chevalier at Fingask and Scone — Great Meeting of Jacobites: Speeches by the Chevalier and Mar—Excited reply by a Highland Officer-Flight of the Chevalier and Mar—The Chevalier's letter of explanation to Oliphant of Gask—Jacobite prosecution of the New Magistrates—Prosecution of Provost Davidson and the Jacobite Magistrates—The Jacobites sentenced to be banished—They debate their case before the Lords of Session—Answers to the debate by the Magistrates — Summary of the Rebellion. Rebellion of 1715—The Earl of Mar and Colonel John Hay, Governor of Perth—The Official Correspondence—Barony of Craigie, Family of Ross—Barony of lnchbrakie, Family of Graeme. The Secession Movement and the Wilson Church—State of the River in 1732 made navigation near Perth impossible— Magistrates and Trades petition for authority to discharge vessels at Newburgh and Errol—List of Justices of the Peace in 1740—Remarkable censure on the keeper of the Tolbooth by the Lord Advocate—Perth and the Rebellion of 1745—Oliphant of Gask and the midnight riot—The Tacksmen's fishing boats "commandeered"—Lady Nairne and her daughters support Rebellion—Lady Nairne invites doubtful Jacobites to her bedroom, and orders them to loin the Rebels—Duchess of Perth kidnaps the Crieff letter-carrier and seizes his letters—Denounces him and the Crieff people as "d-----d Judases to the Duke of Perth"—Perth without either Magistrates or Council— Magistrates' addresses to the King and Duke of Cumberland —Magistrates assemble on the ground, and present Gowrie House to the Duke—Characteristic Refreshment bill of the Magistrates—General Wolfe and Provost Crie on Civil and and Military Law—Wolfe's Officers made burgesses. Ancient streets and Market Booths—Address by Magistrates to George II. —Address by Magistrates to George III. 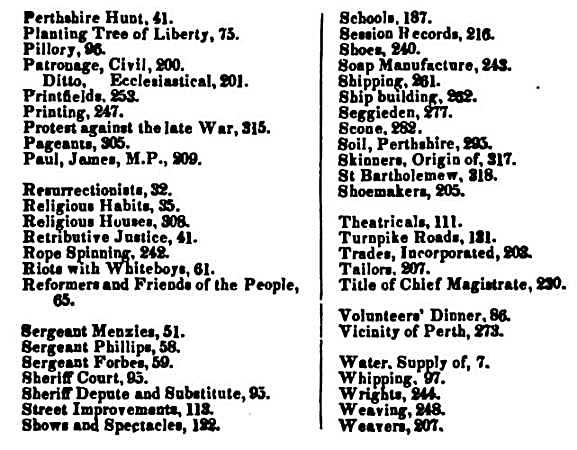 on his Accession—The Banking Mania of Perth, 1793: six local Banks started — Appointment of first Chamberlain of the Burgh—John Wesley made a Burgess—The New Bridge of 1764—Meal Riots of 1773—Address by Magistrates to George III.—American Rebellion — Insufficiency of St. John's Church, and Erection of St. Paul's—Perth Political Societies of 1782—Ludicrous incident on the North Inch: Adjutant stripped and whipped by women—Foundation of the Perth Library and Museum—Foundation of the Gaelic Chapel—Raising of the 90th Regiment: Lord Breadalbane and the Fencibles—Death of the Tolbooth—Ecclesiastical Arrangements of the City: Deed of Disjunction and Erection; Boundaries of the Four Parishes, and Confirmation by Court of Session—Official Position of Perth in the Roll of Burghs—Embodiment of the Perthshire Yeomanry —The French Prisoners and French Depot of 1812. 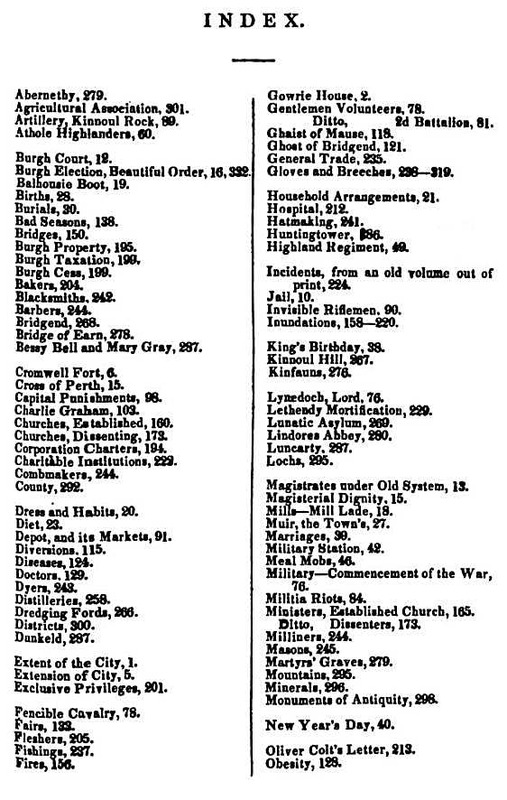 The Fairs and Markets of Perth—Establishment of the Four Pre-Reformation Fairs: Palm Sun'-E'en, Midsummer, St. John's, Andrewsmas, and the Post Reformation Market, Little Dunning—Establishment of the Post Office, 1689— Proclamation by William and Mary—First letter of the Postmaster-General—First Postmaster of Perth—Postal Arrangements, 1732—Reform Bill Agitation, 1832—Claims of Perth for a Member of Parliament—Address by the Magistrates to the Grand Duke Constantine—The Melvill and Munro-Melvill Trusts — Foundation of Murray's Asylum—The ancient and modern Seals of the Burgh— The official Seals of the Monasteries, including that of the ancient Abbey of Scone—Kalendar of Charters granted by the early Kings to the Town of Perth—Translations of these prepared for this work—Some of the Charters of the four Monasteries.